According to a press release from Swarovski, the crystal brand will be offering Swarovski Chinese Ornaments in July, 2012. There are four small ornaments that are a part of the Chinese Window Ornament collection. All four of the Swarovski Chinese Ornaments utilize the newest Crystal Pixel technology, which allows the crystal to sparkle from both sides. The ornaments are decorated with a red silk tassel and retail for $55 each. The Swarovski Fu Ornament is a Chinese character symbolizing prosperity, well-being, and luck. The Swarovski System is 117350. The overall length of the Swarovski Fu Ornament, including the tassel, is over 7 .75” long. The Swarovski Shou Ornament is a Chinese character that translates as longevity. The Swarovski System is 117351. The overall length of the Swarovski Shou Ornament, including the tassel, is over 7 .75” long. The Swarovski Chinese Coin Ornaments stand for money and wealth. There are two Swarovski Coin Ornaments in the collection. Swarovski Coin Flower Ornament – Swarovski System # 1175346. 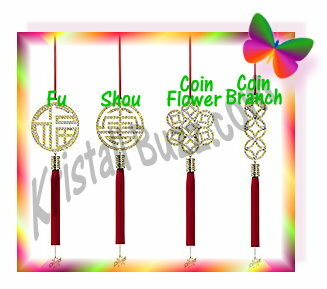 The overall length of the Coin Flower Ornament, including the tassel, is over 7 .75” long. Swarovski Coin Branch Ornament – Swarovski System # 1175348. The overall length of the Coin Branch Ornament, including the tassel, is over 8.5” long. Swarovski’s news indicates that the new Window Ornaments could be hung in the home, car, or any other small place. Great news….these new Chinese Window Ornaments do not look nearly as fragile as the Annual Edition Swarovski Ornaments that Swarovski fanatics typically purchase. That should make them substantially easier and more fun to display! The new technology used in the Chinese Ornaments is a terrific idea to the innovations by the crystal giant. Swarovski is introducing some new techniques they call innovative “Crystal Pixel” technology. So you may be wondering where to find this new methodology for creating fabulous collectibles? Actually, the Crystal Pixel technology can be found on the newest Swarovski Ornaments! The newest ornaments that our favorite crystal brand has released are Swarovski Ornaments that are sold as a set of 3 (3 silver stars or 3 gold snowflakes). Heinz Tabertshofer is the Swarovski Designer credited with these 2 new ornament creations. The claim to fame on the Crystal Pixel technology is that with the unique placement of the tiny chatons on both sides of the metal , light can now pass through allowing spectacular lighting effects. Swarovski Pixel Snowflake Ornament Set – Swarovski system # 1135179 and Swarovski part number 9400 000 366. The ornament set of snowflakes is silver in color and features crystal moonlight chatons. The Swarovski Snowflake Ornament hangs from a white satin ribbon. Swarovski Pixel Star Ornament Set – Swarovski system #1135182 and Swarovski part number 9400 000 367. The ornament set of stars is gold in color and features crystal moonlight chatons. The Swarovski Star Ornament hangs from a gold satin ribbon. Naturally, the Swarovski Pixel Snowflake Ornament Set and Swarovski Pixel Star Ornament Set are both at the Swarovski shoppe online. Each set of 3 ornaments retails for $75. Great news for Swarovski Crystal Society members….the golden 2011 Ornament, which is exclusive to the Swarovski SCS members, is now available on the Swarovski web site for purchase! This special Swarovski Annual Edition Ornament is limited to one per member, and is only available through the end of 2011. 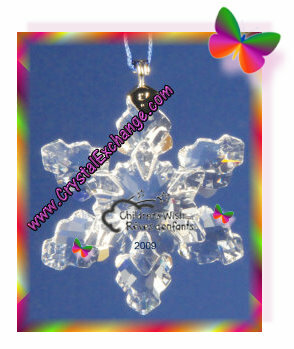 Our favorite crystal brand began producing Swarovski AE ornaments in 2009. Being a success, Swarovski continued the trend into 2010 and 2011. The primary difference between the annual edition Swarovski Ornament and the SCS Ornament, is that the Swarovski SCS ornament is ‘Golden Shine’ in color instead of clear. Additional differences include the gold-colored ribbon that it hangs from, and the special gold-colored packaging in lieu of the traditional blue Swarovski Box. Pictured is a complete collection of Swarovski SCS Golden Shadow Ornaments. If you are a Swarski SCS member and have not yet begun your collection of these limited edition ornaments, it’s not too late. 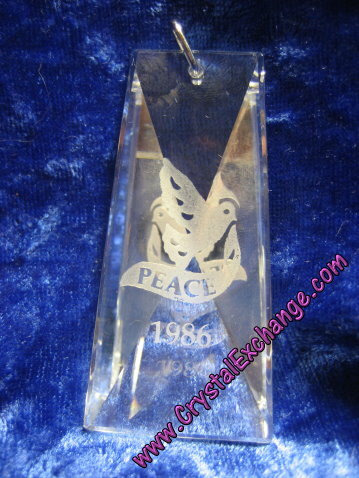 Crystal Exchange America has both the 2009 and 2010 editions available. As a hint, ornaments are most expensive during the Christmas holiday season, so pricing will be more attractive now, than in another two months. 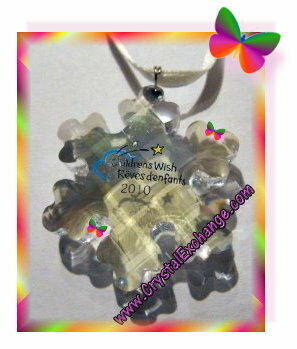 To find them on the web site of this ‘retired Swarovski dealer’, go to www.CrystalExchange.com . Then check out the category ‘Christmas and Ornaments’. Not only will you find the Swarovski SCS Golden Shadow ornaments, you’ll find many other Swarovski ornaments dating back to 1987. Swarovski has announced to its SCS members that beginning August 29, residents of 23 select countries will have the opportunity to purchase “Swarovski Christmas Set”, an online limited edition. What is not mentioned in the announcement is the price for the Online Limited Edition, only that there is a ‘considerable savings’. By now, Swarovski crystal fanatics may have already purchased the 2011 Christmas Ornament, so they might not be interested in a complete set. It is also worth mentioning that for several weeks now, the 2011 Christmas Ornament has NOT been available for purchase at the Swarovski web site (at least for USA residents). The Swarovski Christmas Set is also NOT available for purchase at the Swarovski web site. Speculation is that they are SOLD OUT from the manufacturer. So if this is the case, you may find this to be great news that you have opportunity to still get the ornament if you’re willing to purchase the set, which also includes the little star and stand accessories. Also, the Swarovski 2011 Ornament is available at the Crystal Exchange America web site: www.CrystalExchange.com . Simply look in the “Christmas and Ornaments” category to find the 2011 Swarovski Ornament as well as Swarovski ornaments from prior years! The Kristall Buzz is always an exceptional source of reliable information on Swarovski figurines and collectibles. Catch the buzz….check back frequently for the latest in Swarovski News. Swarovski has made the official announcement to its SCS members that the SCS Christmas Ornament, Annual Edition 2011 will be available in September, 2011. The Swarovski Crystal SCS Ornament, which is limited to one per member, uses the same design as the 2011 Annual Edition Ornament. The difference between the two is that the Swarovski 2011 Annual Edition Ornament utilizes clear crystal and hangs from a white satin ribbon. The SCS 2011 Ornament utilizes the golden shadow crystal and hangs from a bronze colored ribbon. The Swarovski SCS 2011 Ornaments are approximately 2.5 inches wide and 3.25 inches in height. Swarovski began producing the SCS Ornaments in golden shine crystal in 2009. The Swarovski 2009 Ornament designer was Elke Kumar. Both the Swarovski crystal clear and golden shine ornaments retailed for $75. Eva Marie Ried designed the Swarovski 2010 Ornament. Both the Swarovski crystal clear and golden shine ornaments retailed for $75. Based on the pictures I have seen of the 2011, I think the Swarovski SCS 2011 Ornament (gold one) is going to be my favorite of all the SCS Ornaments produced so far. I’m looking forward to securing mine ASAP. If you are wanting to purchase any prior year Swarovski crystal ornament, including the Swarovski SCS Ornaments, Crystal Exchange America has a large selection on their web site: www.CrystalExchange.com . Go to the ‘Christmas & Ornaments’ category in the online store. 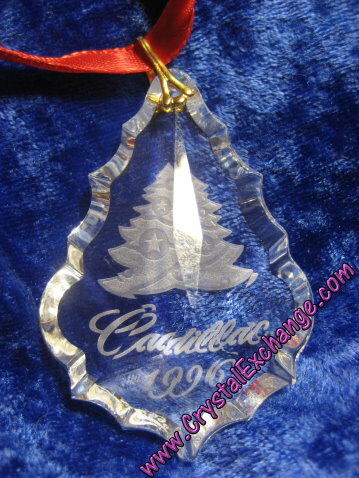 Swarovski 2011 Ornament – More Christmas in July! The Swarovski 2011 Ornament is celebrating 20 years of the Swarovski Annual Edition Ornaments. The 2011 crystal ornament is now available in the USA at select retailers and will be available on the Swarovski web site in mid-July. The 2011 Swarovski Ornament is clear crystal, with a silver-colored metal tag inscribed with 2011, hanging from a white satin ribbon. The ornament is offered by itself, or in a set with 2 smaller star ornaments. The crystal brand has been producing Swarovski Ornaments since 1991. Beginning in the 1990’s, there was a pattern of Swarovski Star Ornaments and Swarovski Snowflake Ornaments. The odd years were deemed to be stars, while the even years were deemed to be snowflakes. 1999 through 2002, the ornament designs became more abstract, and until 2003, were not labeled as a ‘Swarovski Star’ or ‘Swarovski Snowflake’ ornament. In 2003, the pattern continued with odd years being stars and even years being snowflakes. It is interesting to note the ribbon color for the 2011….it is white. Since 1993, the ribbon color has been navy blue. If you are starting your crystal figurine ornament collection this year, you may want to consider adding some of the retired ornaments to your collection too. 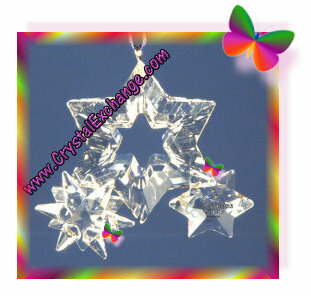 Crystal Exchange America has many years available of the Swarovski Ornaments on their web site. They can be found in the ‘Christmas and Ornaments’ category of the store! When Swarovski crystal collectors mention Swarovski AE Ornaments, we almost immediately think of Christmas ornaments, the Swarovski Star Ornaments and the Swarovski Snowflake Ornaments. However, these are not the only AE (Annual Edition) ornaments done by Swarovski. 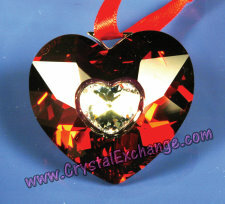 The crystal brand also made Swarovski Crystal AE Heart Ornaments from 2004 – 2008. Swarovski AE 2004 Heart Ornament – This crystal heart is a clear heart with a red heart in the center. 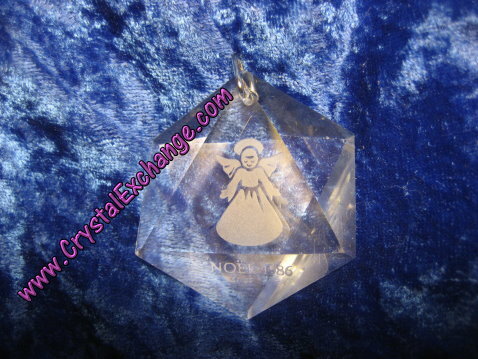 The clear heart is laser etched with 2004. Swarovski AE 2005 Heart Ornament – This crystal heart is opposite of the 2004 ornament. It is a read heart with a clear heart in the center. The red heart is laser etched with 2005. Swarovski AE 2006 Heart Ornament – This crystal heart is clear (like the 2004 heart), but it has a pink heart in the center. The clear heart is laser etched with 2006. Swarovski AE 2007 Heart Ornament – This crystal heart is much different than those from 2004 – 2006. It is a peach-colored heart and it laser etched with 2007. This Swarovski AE heart was used on the Swarovski Steiff Bear ‘Jewels’ in 2007. Swarovski AE 2008 Heart Ornament – This crystal heart is rosaline (pink) with a beaded loop below the heart. It is laser etched with 2008. I found the retired Swarovski Heart Ornaments 2005 – 2008 on ebay for Swarovski collectors looking for them. There is no implied endorsement on any of the sellers, the link is for quick access to the items. 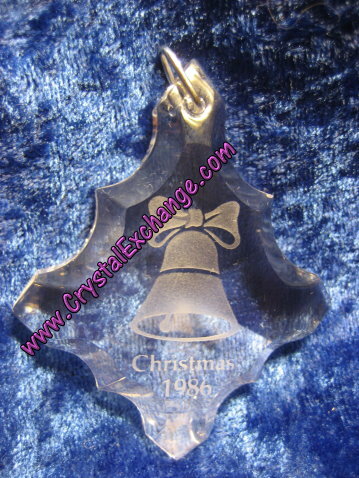 Crystal Exchange America has the retired 2004 AE Heart Swarovski Ornaments on their web site. It is listed in the ‘Christmas & Ornaments’ category of the store. Happy Valentine’s Day to Swarovski fanatics around the world! It’s been snowing A LOT here, and I thought it would be neat to experiment with a camera and Swarovski ornaments in the snow and ice! I picked out 2 colorful ornaments, the Swarovski Santa Hat and the Swarovski Festive Hearts Ornament. The Swarovski Santa Hat Ornament was hung from a branch in a frozen tree (it’s only 10 degrees F here!) This Swarovski Ornament was introduced in 2008 and it is still current. The price on the Swarovski web site is $75. 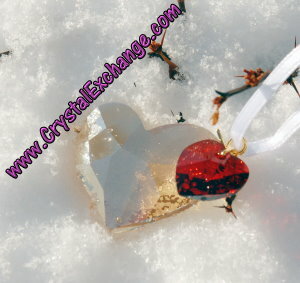 The Swarovski Festive Hearts Ornament was resting in the snow (about 6″ of snow in the last day!). This Swarovski Ornament can be purchased as a single ornament at the Swarovski web site at $41. It is worthwhile to mention that Swarovski Festive Hearts is also included in two different ornament sets: the Swarovski Mini Ornament Set (Sparkling Cookie, Twinkling Mittens, and Festive Hearts) and the Swarovski Stocking, Hearts, Candy Cane Set. The Swarovski ornament set with the candy cane retails for $110 at the Swarovski site. However, the Swarovski ornament set with the twinkling mittens is presently on sale for $55! This Swarovski crystal figurine group is three ornaments in the same package (not three ornaments in three separate boxes sold as a group). Since it is on sale, I’m thinking that this will soon be retired / discontinued “as a set”. This is speculation….I have not checked with any Swarovski retirements listings. I hope that all Swarovski fanatics are staying warm and safe in the frigid winter season! Perhaps there will be some more pictures of Swarovski crystal in the snow posted here again! 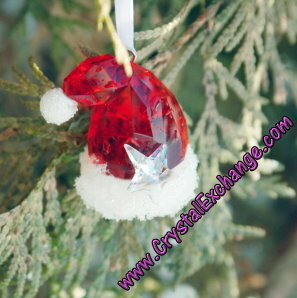 If there are any retired Swarovski ornaments on your wish list, check out Crystal Exchange America web site http://www.crystalexchange.com/ ….there are a lot listed there. The end of 2010 is drawing near, Swarovski crystal collectors should be sure that you have purchased the desired Swarovski Ornaments for your collection: the annual edition Swarovski 2010 Ornament, the Swarovski SCS 2010 ornament, and the limited edition Swarovski red tip ornament. Presently, the Swarovski 2010 Ornament (in the silver crystal product line) is still available at the Swarovski web site, and likely in boutiques and authorized retailers. When the new year chimes in, the Swarovski 2010 ornament will not be available online or in the boutiques, and collectors who waited to purchase will turn to secondary market Swarovski brokers or perhaps the online auctions to make their purchases. The Swarovski red tip ornament can be found on a number of web sites and online auctions. The Swarovski part number is 9400 000 296 and the Swarovski system number is 1 074 802. The unique limited edition Swarovski ornament is an exclusive 2010 Swarovski ornament with red tips. It is a 6-pointed snowflake ornament. The middle crystal component of the ornament is clear cut, with the 6 points highlighted in light siam (red) crystal. The well-recognized Swarovski swan is imprinted on the metal tag and “2010” is engraved on the front of the ornament. 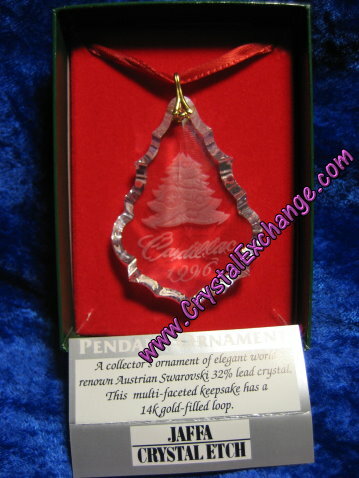 The ornament hangs from a red satin ribbon and the ornament is presented in the customary Swarovski blue packaging complete with a Swarovski certificate. Verena Castelein is the Swarovski artist credited with the design. The Swarovski SCS 2010 Ornament is a must-have ornament for Swarovski crystal fanatics. The SCS Swarovski figurine is ‘golden shadow’ in color and has an identical design to the silver crystal 2010 ornament. The only other difference is cognac-colored satin ribbon for hanging. This Swarovski Club feature requires SCS membership when purchased from the Swarovski web site or authorized retailer. 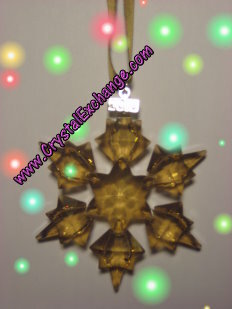 We have more information about Swarovski Ornaments at the Crystal Exchange America web site: http://www.crystalexchange.com/ . Swarovski has produced holiday ornaments dating back to 1981. The 1981 Snowflake ornament was designed to be either a Christmas ornament or a Christmas pendant since it was attached to a long chain. Because of the timing a branding at the time, it is the only Swarovski ornament to bear the block SC logo. Swarovski continued releasing ornaments in 1984, 1986, 1987, 1988, 1989 and 1990 before settling in to the Swarovski Star / Swarovski Snowflake tradition. During the years of 1984 -1990, the Swarovski ornaments were issued by their Giftware Suite division and did not contain any type of Swarovski logo. In 1986, the Swarovski Ornaments were referred to by the company as “Holiday Etchings”. There were 11 different shapes and sizes of the Swarovski Holiday Etchings. From the literature I have seen, there were 4 angels, 3 bells, a dove, a peace, a holly, and a snowflake design on various shapes. The single most important feature of knowing that these were limited editions to the year of 1986, is that the year is etched on these ornaments. All these 1986 ornaments that I have seen are all in white velvet-like bags and have white Giftware Suite boxes. All part numbers on the boxes are 5 digit numbers, beginning with “9”. It is worthwhile to mention that these ornaments do have look-alikes, even made by Swarovski. Many were made with the same design and shape, but do NOT include the etched 1986 on them, so they were not limited editions. It has been documented that they were sometimes packaged in red, blue, or green vinyl-like boxes. Being a few weeks before Christmas, there are countless Swarovski Ornaments listed for sale in the online auctions. I have a few out there, on behalf of our clients, that have just ended or are ending in the next week. So all you Swarovski crystal fanatics… if 1986 Swarovski Ornaments are on your wish list this Christmas, make sure that the 1986 is visible on the auction image to ensure that it is truly a limited edition ornament. Happy Sparkling Holidays from the Kristall Buzz! I found the Swarovski Rockefeller Center Tree Lighting Video on YouTube yesterday. Check it out this video with some event highlights and official tree lighting if you missed it November 30 when it was live on tv. This is a beautiful tree covered with brilliant lights and ornaments! 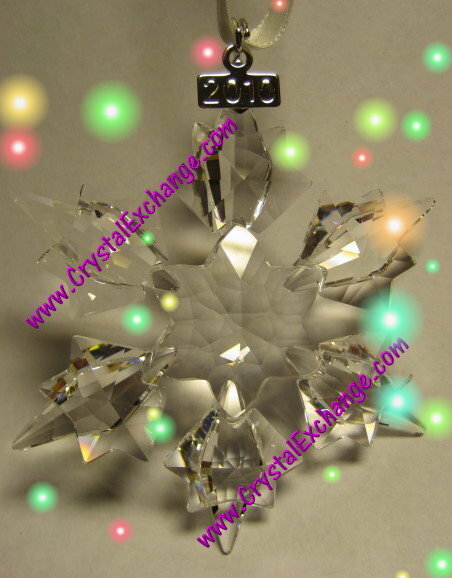 If you are looking for Swarovski Ornaments to hang on your Christmas tree, from 1991 – 2010, check out the Crystal Exchange America web site. We have many years available! This is the time of year when Swarovski Ornaments are most popular on the secondary market and Ebay auctions. The current Swarovski 2010 ornament is available as well as very old, hard-to-find, and rare ornaments. Presently, there is a rare Swarovski Ornament on Ebay: the 1996 Cadillac Ornament. The 1996 Cadillac Ornament is a teardrop-shaped Swarovski crystal, customized for the Cadillac company. It has a Christmas tree etching in the middle. Below the etching is the word “Cadillac”, and the feature year 1996. This ornament is in a green box, with a velvet-like lining on the inside. I did find other Cadillac ornaments in addition to the 1996 Swarovski Cadillac ornament on Ebay. 1998 and 1999 Cadillac ornaments were listed, but closed at ‘unsold’. From my research, I found even more: 1997, 1998, 1999, and 2000. All the Cadillac ornaments I found utilize the teardrop crystal. The 1997 Swarovski Cadillac ornament features a snowman in the etching. The 1998 Swarovski Cadillac ornament features bells in the etching. The 1999 Swarovski Cadillac ornament features a wreath etching. Lastly, the 2000 Swarovski Cadillac Ornament features a penguin in the etching. All ornaments contain the word Cadillac, with the issue year below. All are packaged in similar green boxes, with red interior. 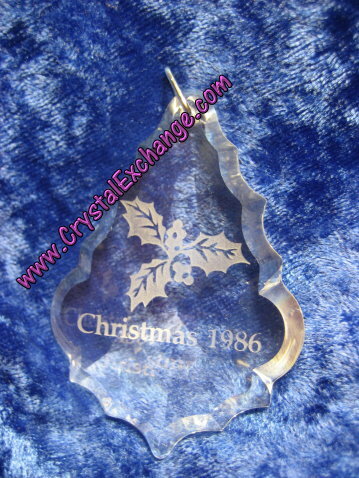 The same Swarovski Crystal teardrop component was used for the 1984 Swarovski Ornament, 1987 Swarovski Ornament, 1989 Swarovski Ornament, and some 1986 Swarovski Holiday Etchings. The 1987 ornament displays at candle. The 1989 Ornament displays a dove and the teardrop crystal is framed by gold-tone metal in the shape of Christmas tree. The 1986 Holiday Etchings display bells, angels, holly, mistletoe, and other designs. These 11 Holiday Etchings are among the rarest of Swarovski Ornaments. All these Swarovski ornaments mentioned here (from the 1980’s) have the year etched below the feature design. They were all released by Swarovski by their “Giftware Suite” division, so they were only available in the USA at the time of production. 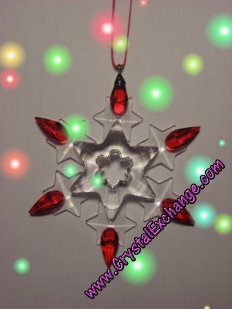 Some of these Swarovski Ornaments can be found at the Crystal Exchange America web site. If you have one of these and wish to sell, now is the time to do it with Swarovski crystal fanatics collectors naturally looking at this time of year. Just as if Swarovski read my last posting wanting to see the Hong Kong Christmas Tree light show….here it is! Swarovski crystal fanatics….you’ve got to see this! This is phenomenal! The Swarovski Christmas Tree is synced to the lively music for an awesome holiday light display. I’m curious to know where the 200 2010 Swarovski Ornaments are placed. And the 20 million Swarovski crystals…..it must certainly look like sparkling glitter. Impressive job Swarovski! I am finding Swarovski’s presence in worldwide this year during the Christmas season. Yesterday, I found this Swarovski Crystal video clip about the assembly of the Swarovski Hong Kong Christmas Tree. This amazing tree structure is 30+ meters tall, decorated with 20,000,000+ Swarovski crystals, and 200 Swarovski Ornaments (2010 Annual Editions). In the evening, several light shows are held daily from the end of November until early January that seemingly bring the Swarovski Christmas Tree to life. More images and details of the Swarovski Christmas Tree in Hong Kong can be found at the Discover Hong Kong web site. You can believe I’ll be on the lookout for videos of the Swarovski tree lighting as this will be the closest I’ll ever get to seeing it! On November 18, 2011, Swarovski Canada and the Toronto Eaton Centre hosted a kick off celebration unveiling the Swarovski Crystal Wish Tree in support of the Children’s Wish Foundation of Canada. This is the sixth year of the collaboration and Swarovski has donated approximately $100,000 each year to the foundation granting wishes to children and families across Canada. The crystal giant has a special limited edition Swarovski ornament produced each year for the celebration. The 2010 ornament resembles the Swarovski Samantha Snowflake Ornament (which retired in 2008) with a special inscription applied to the front side. The Swarovski Crystal ornament is just over 1.5″ in height. It comes in the Swarovski blue box, with generic Swarovski certificate, and another card indicating that it is a limited edition figurine. The part number for the ornament is 9400 000 074 (same as Samantha Snowflake) and the system # for the ornament is 1094095 (different from Samantha Snowflake). Only 1200 of the commemorative ornament were produced. These Swarovski crystal ornaments are available at Swarovski gallery stores across Canada and retails for $55, with all proceeds going toward the Children’s Wish Foundation. 2007 – limited to 1200. This one is like the Swarovski Twinkling Stars ornament that retired in 2007. 2009 – limited to 1100. This one is like the Swarovski Little Snowflake ornament that retired in 2008. More information about the wonderful dreams filled can be obtained at the Children’s Wish Foundation web site.